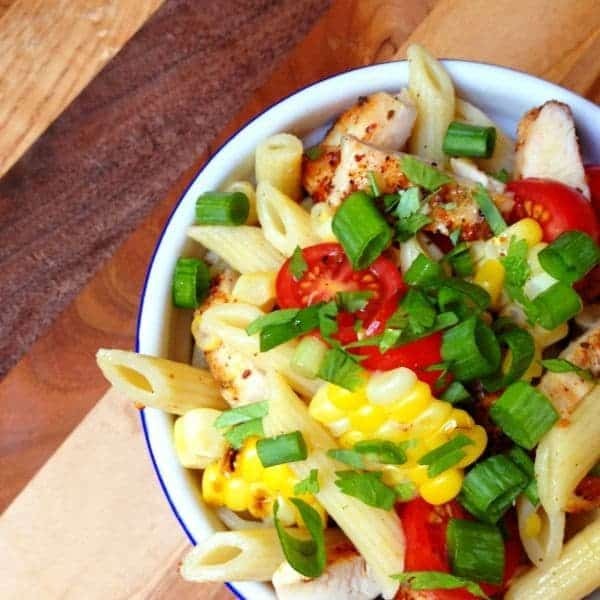 Charred corn, spiced grilled chicken and juicy tomatoes give this main dish pasta salad lots of flavor without a lot of added calories. Southwest Grilled Chicken and Corn Pasta Salad is ideal for summer entertaining and BBQ’s because it can be made in advance and served cold or at room temp. Chicken can easily be swapped out for pork tenderloin, flank steak or whatever meat you have on hand. Want a vegan version? Skip the meat all together and add black beans instead. If you need a quick lunch or dinner this dish is a great way to transform leftover grilled meat and veggies into a healthy and delicious meal that your family won’t recognize as leftovers. Diced avocado or Mexican cotija cheese would be great additions to this salad if you have either on hand. Just don’t forget the pasta. What baby wants, baby gets. Are you craving pasta now?? While grill is pre-heating, season chicken breasts with cumin, smoked paprika, oregano, salt and pepper. Rub chicken well to make sure spices are evenly coated. Spray the grill with non-stick grilling spray then add the chicken breasts and corn. Cook chicken 3-5 minutes on one side until nicely browned. Flip to other side and cook until browned or internal cooking temperature reaches 160 degrees fahrenheit. While chicken is cooking, rotate corn every 2 minutes until all sides have a bit of char an are bright yellow/white. Remove chicken and corn from the grill and set aside. Let chicken rest at least 5 minutes before slicing. Toss well and check for seasoning. Add salt and pepper to taste. Dish can be served warm, room temperature or cold. Tastes even better the next day - great for making ahead. I love pasta. I would lighten up pasta with oil and vinegar. I get your newsletters and receive your emails with great recipes. Thanks. Just made this salad last night~ it was AWESOME!I will be marking again soon. I love pasta. I would lighten up a dish with light olive oil and red wine vinegar. I subscribe to your newsletter and emails. Thank you. This looks fabulous … I’m going out today to buy the ingredients to make for my dinner tonight! Follow you on FB-also Dreamfields on FB. I would use light olive oil and red wine vinegar. I subscribe to your newsletters and emails and love pasta. The Lemon Bowl on E=mail~FB~Pintrest. I lighten up my pasta recipes by using a little olive oil to coat the pasta. I follow Dreamfields on Facebook. I like to use plain yogurt in place of mayo to lighten a pasta salad. I have followed Dreamfields pasta in twitter. I have liked this FB page and to lighten up pasta recipes, I like to use a little olive oil instead of mayo. I think it makes a big difference. Am dieting and trying to watch my carbs. Sounds delicious! I love Dreamfields Pasta. I use it in salads and in hot dishes. My favorite way to lighten up a meat pasta dish such as lasagna or spaghetti is to use ground turkey instead of beef, and add a little beef broth to the sauce. I then cook it down to thicken it up. Delicious!! I like using alternate pesto’s instead of mayo, such as garlic scape or kale pesto. Then I load it up with veggies! Lighten up a pasta salad with light oil and red wine vinegar and lots of vegetables. I subscribe to your emails and newsletters. I follow Lemon Bowl on FB and Pinterest-Email. I follow Dreamfields on FB and Pinterest. I really like to use alot of veggies in salads with Evvo and differant vinagers. Lighten up pasta dishes with olive oil and red wine vinegar usually always works. I subscribe to your newsletters and emails, Liz. Thank you. I add lots of vegetables to the recipes and because I am vegetarian, I leave out meat! Looks awesome… Got the ingredients to make it for dinner tomorrow night. Hubby’s excited too! I always try to find pasta salad recipes that I can make while skipping the mayo. at all of the differant wines they have~white wine~champagne vinegar. It’s endless and I get so many ideas. This looks perfect :) the colors in this salad are wonderful! I add chicken broth and/or dry white wine so I don’t need to use as much olive oil/fat.